Development projects often take a long time to start and a long time to finish. Indeed the theme of this post about project updates could easily be persistence. Regardless of how long they take, however, we'd like to keep sharing what we know about the proposed projects that have come before our Community Development Committee. The WBNA appreciates the opportunity to review many of the development projects seeking a home on the west side. Here are a few updates on the status of projects in the works. 1413 Westminster – Sin Bakery's new home! 1560 Westminster (WBNA Headquarters) – exterior work by Dwight Harrison and by Monica Shinn of Queen Street Metals. The fountain is intentionally named Decatur Square Fountain in remembrance of this site's former name of Decatur Square. Sin Bakery's proposal to transform 1326 Westminster Street (former L & L Gas & Service) into a restaurant won the WBNA's Request for Proposals process for that property in 2013. But the EPA's discovery of hazardous materials on the site doomed the building to demolition (see next item), and Sin had to abandon those plans. Committed to opening a location on the west side, however, Sin owner Jen Luxmoore eventually found a home in the former Healing Paws building at 1413 Westminster Street which she purchased this month. Work by neighbor-owned Casa Buena Builders has already begun on the interior, evidenced by a dumpster out front. Sin Bakery on the west side is planning to open in the spring of 2017. Congratulations to Jen and her admirable persistence! An important gateway corner to our iconic and beloved park, 1326 Westminster Street was found to have contamination levels that were too high for re-use in the property's current state. While it was our intention to preserve this 1950s historic gas station, WBNA regretfully determined that the existing building would need to be demolished. The EPA's Emergency Response and Removal Program stepped in to manage remediation and demolition. During the months of October and November, the building was demolished in a "step-wise approach" that employed removal and disposal of hazardous materials in stages. The contaminated materials will soon be hauled away to different disposal sites, after which the underground storage tank will be removed. As EPA remediation of the site wraps up, WBNA looks forward to finding a future use of 1326 Westminster Street that will benefit our neighborhood and maximize the potential of this property's special location. Learn more about the history of L & L Gas & Service, the demolition process and its current status. After all this time and, again, persistence, the project is finally nearing completion. The square has been built, fabrication of the fountain is complete (see Howard Newman's photos above), water service is functional, trees and landscaping have been planted, aggregate sidewalks and new curbing have been installed, and the street is being paved this week. A bench, handrail and bike hitches should be installed by Thanksgiving. And, most exciting, the fountain is slated to be installed on Wednesday, November 30, between 10:30 and 11am (come by if you'd like to check it out). With winter approaching, the fountain will be tested to make sure it works, and then immediately winterized. Lastly, Providence Water is slated to repair the cobblestones that were damaged on West Fountain Street before the end of the year. If you haven't seen Luongo Square in a while, take a walk during these fine fall days and check it out. It's a small yet remarkable space. WBNA Headquarters has undergone a facelift. Phase 1 is now complete and included repair and repainting of the building's exterior steel panels, antique bay signage, foundation and pump apron, and raised concrete platforms. Phase 2 will begin in the spring and includes repainting of the antique gas pump. 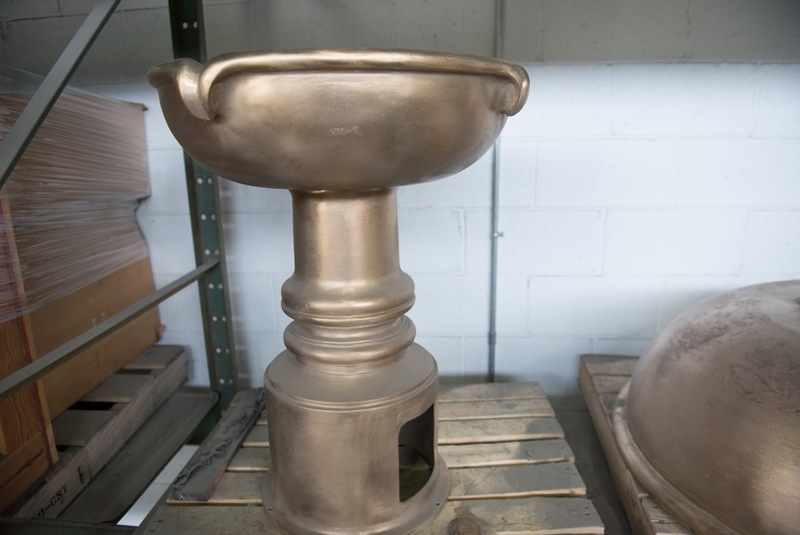 Restoration work is being done by Dwight Harrison and by Monica Shinn of Queen Street Metals. This exterior restoration work is made possible thanks to a matching grant from the 1772 Foundation, Inc.